Hi New Friends! Becca here, from The Dabblist. I blog about recipes, DIY tutorials, life hacks and all around inspiration to create a happy and healthy life. Today, I invite you to take a moment for some self-care. Just 20 minutes for a simple, homemade indulgence. All you need is to take some deep, cleansing breaths and grab a bowl of warm water and nature’s best spa remedies. This foot scrub and soak ritual are both something you can easily create in your home using ingredients found in the kitchen. Combine 4 tablespoons brown sugar with 4 tablespoons olive oil in a small bowl. Add in the juice from half a lemon and 1-2 sprigs of rosemary, chopped up. 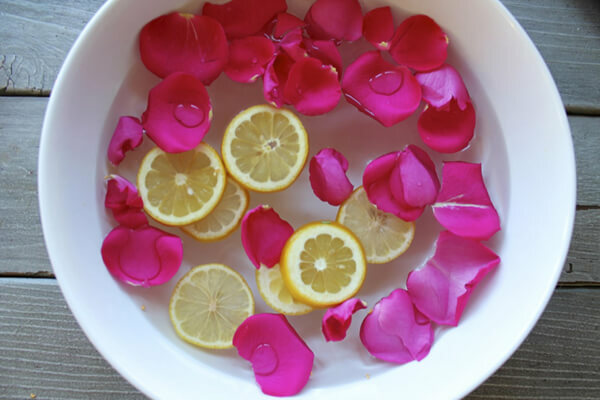 Fill a bowl with warm water, adding in rose petals and lemon slices. 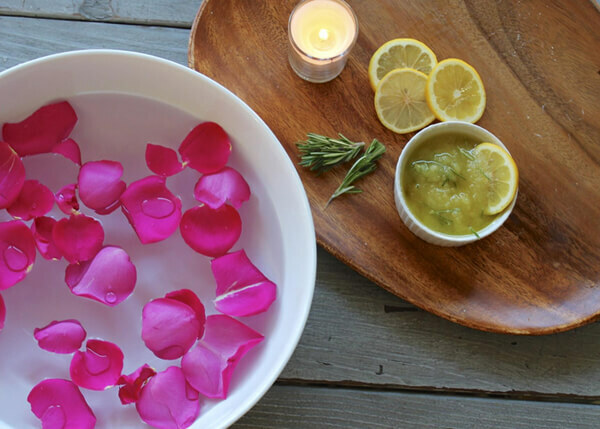 Place your feet in the warm water and massage with the homemade scrub. Like this tutorial? You can find more beauty recipes and wellness DIYs on The Dabblist. I wish you all a beautiful week, and hope you can find a moment to care for yourself soon. Well, I landed here because I make a point in checking out every person who leaves a comment on my blog. I happened to love anything that’s home made and natural, from food to health and beauty care, so will be coming back here for sure. This scrub and soak seems easy enough and I will certainly try it. Thanks so much for dropping by + welcome to our site! Yes, healthy, non-toxic & natural are our middle names so be sure to sign up for our free weekly newsletter to get all of our updates (and uh-maze giveaways) HERE! Great recipe for a scrub and lemon-rosemary-foot-soak. I will definitely try it as I always suffer from swollen feet in summer and this may help relief it as well. Thanks Becca for sharing this recipe and thanks Lisa for having Becca here as a guest sharing her expertise. Yes, Becca’s recipe & gorgeous photo are both beautiful and healthy! Can’t wait to try myself :) Thanks for dropping by. Health + happiness to you. My feet swell up in the hot summer as well. Soaking them really does wonders. There’s also nothing quite like a foot massage, and we often forget we can take care of that ourselves!